The historic cathedral city of Canterbury, with its narrow streets and walkways, is best explored on foot. It is the home of Christianity in England, and has been the ultimate destination for pilgrimages in England for centuries, as described in Chaucer's famous Canterbury Tales. 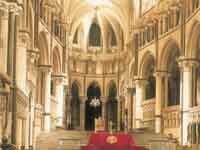 The imposing Canterbury Cathedral is one of the most impressive and evocative in England. It was here that Thomas Becket was martyred in 1170. Visitors can explore the ruins of the original abbey of St Augustine, who brought Christianity to England more than 1,400 years ago, or visit the Canterbury Tales Pageant and meet some of Chaucer's famous characters. For an insight into the cities of medieval England, climb the original West Gate Tower, which is still intact and provides breathtaking views across the city.